Published: Dec. 1, 2014 at 12:27 p.m. 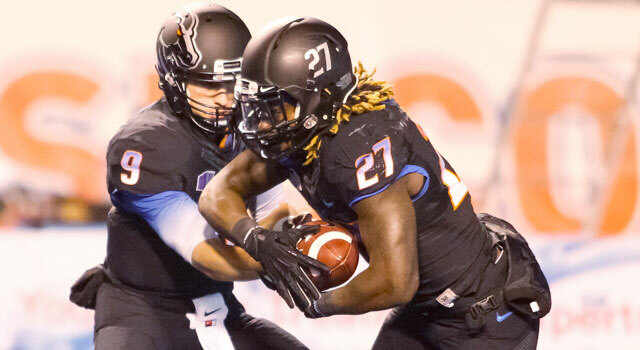 Updated: Dec. 1, 2014 at 12:57 p.m.
Boise State running back Jay Ajayi rushed for 229 yards in a win over Utah State on Saturday night. 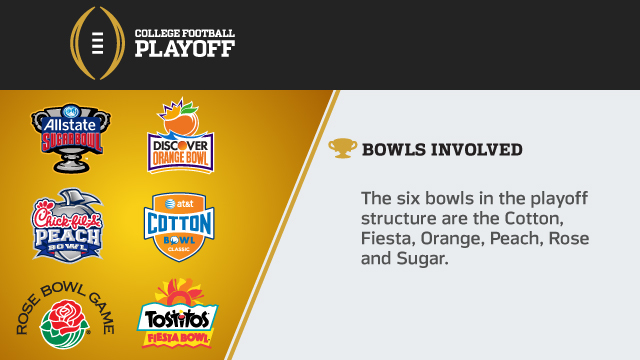 The 2014 college football season is wrapping up, with bowl season just over the horizon. Here are six players who saw their stock fluctuate over the weekend, and my top picks for the College Football Playoff and the Heisman Trophy. QB Brandon Doughty, Western Kentucky: Whenever a quarterback tosses eight touchdowns in a game, it deserves a mention, particularly when it results in a huge win over a previously unbeaten opponent. Thus, Doughty sits atop the list after completing 34 of 50 passes for 491 yards with eight touchdowns and two interceptions in the Hilltoppers' 67-66 win over Marshall. The senior was brilliant picking apart the Thundering Herd with a barrage of pinpoint throws, including the game-winning two-point conversion to clinch the win in overtime. With Doughty pushing his FBS-leading touchdown total to 44, the senior has jumped onto the radar of scouts looking for a gunslinger at the position. RB Jay Ajayi, Boise State: Most of the national attention on the running back position has been directed towards Melvin Gordon, Telvin Coleman and James Conner for their spectacular efforts, but Ajayi is beginning to generate some buzz on the West Coast with his sensational production as the Broncos' workhorse runner. The junior standout has notched seven straight games with 100-plus rushing yards, including a 229-yard effort against Utah State that clinched the team's berth in the Mountain West Championship Game. The "J-Train" has been a monster running between the tackles for the Broncos, exhibiting outstanding vision, pitter-pat and toughness. With Ajayi also displaying home-run speed and acceleration, scouts should pay close attention to the burgeoning superstar who is running rampant in the Mountain West. WR Artavis Scott, Clemson: The top receivers in the NFL typically excel with the ball in their hands in the open field. With that in mind, scouts should be excited about the talent and potential that Scott flashed in the Tigers' 35-17 win over South Carolina. The 5-foot-11, 185-pound freshman torched the Gamecocks for 185 receiving yards on seven catches with the bulk of his work done on shovel passes off jet sweep motion. Scott showed outstanding quickness, acceleration and agility turning the corner while also displaying a nose for the goal line. The combination of instincts, awareness and running skills could make him an intriguing option in a "catch-and-run" passing game built around quick routes and shallow crossers. If Scott can continue to flash home-run ability and dynamic running skills over the next few seasons, he could be the next Clemson receiver to make his mark in the pros. LB Paul Dawson, TCU: It takes a tremendous defensive effort to force six turnovers and register two defensive scores, which is why the Horned Frogs' defensive leader deserves some recognition this week after TCU obliterated Texas 48-10 on Thanksgiving night. Dawson keyed the stifling effort by notching 10 tackles (nine solo), including a pair of tackles for loss and one interception. The senior's spectacular play has been one of the reasons why the Horned Frogs are possible CFB Playoff participants and why many view him as the frontrunner for the Big 12's Defensive Player of the Year award. QB Everett Golson, Notre Dame: It's amazing how quickly fortunes can change in college football when you're a quarterback at a high-profile program. In a matter of a few weeks, Golson went from Heisman Trophy contender to likely backup quarterback following a series of turnover woes that culminated in his benching against USC. Golson finished the regular season with 22 giveaways (14 interceptions; eight fumbles) and didn't show sound judgment or ball security in the Fighting Irish's biggest games. With a dismal showing against the Trojans sealing his fate as the team's starter, NFL scouts will have to pore over the tape to see if the diminutive passer is worthy of draft consideration at this point. CB Eddie Jackson, Alabama: Playing cornerback in today's "no touch" game is challenging, but NFL scouts and coaches cringe whenever they see a defensive back repeatedly toasted for big plays on the perimeter. After watching Auburn WR Sammie Coates have his way with Jackson for most of the game in the Iron Bowl, evaluators will certainly question the sophomore's technique, speed and burst at the position. Jackson simply looked overmatched in one-on-one situations, as evidenced by the five-catch, 206-yard effort from Coates. With the Crimson Tide poised to play a number of speedy receivers in the SEC Championship Game and postseason tournament, Jackson must be ready to deal with an onslaught of throws heading in his direction. 1. Florida State: The Seminoles shouldn't need to apologize for winning without pizzazz. While the 2013 unit dominated opponents on both sides of the ball, the 2014 version wins on grit, guile and resiliency. Overcoming an awful performance from Jameis Winston (four interceptions) to knock off Florida in an intense rivalry game, the Seminoles are a win away from securing a playoff berth and a chance to defend their crown as national champions. 2. Alabama: The Crimson Tide is considered the top team in the college football by most observers, but they are just as flawed as the other contenders on this list. Nick Saban's vaunted defense surrendered 600-plus yards to Auburn and struggled containing Nick Marshall in a 55-44 win. Although securing the win is ultimately what mattered most, the disappointing defensive effort certainly shed light on Alabama's defensive issues against fast-paced offenses. With a handful of "tempo" squads contending for spots in the playoffs, the Crimson Tide isn't a shoo-in to make it to the winner's circle in college football's inaugural postseason tournament. 3. Oregon: The Ducks continue to roll in relative anonymity on the West Coast. Oregon has topped the 40-point mark in each of its seven consecutive wins while displaying a high-octane offense that overwhelms opponents on the perimeter. With a defense that is also rounding into form, the Ducks might be better positioned to exact revenge on Arizona and secure their spot as the Pac-12 champion. 4. 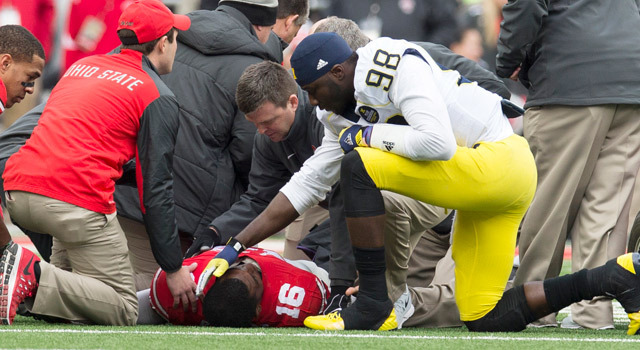 Ohio State: The loss of J.T. Barrett makes it possible that the CFB Playoff selection committee will vault TCU or Baylor ahead of the Buckeyes in the final rankings. Despite the absence of one of the most productive playmakers in college football, Ohio State earns a spot on my list after dispatching another opponent and earning its way to the Big Ten Championship Game. If the Buckeyes knock off Wisconsin in the title tilt, it would be hard for the committee to deny Urban Meyer's squad a trip to the postseason after losing a pair of Heisman Trophy candidates (Braxton Miller and Barrett) on the way to grabbing the conference crown. 1. QB Marcus Mariota, Oregon: The Ducks' star certainly put a bow on a fantastic season with his spectacular performance in the Civil War. Mariota accounted for six touchdowns and showcased his full repertoire of skills in Oregon's 47-19 win over Oregon State. The effort pushed his touchdown total to 47 (36 passes; 11 rushing) and makes him the clear frontrunner for the award heading into the Pac-12 Championship Game. 2. RB Melvin Gordon, Wisconsin: Running backs are no longer viewed as marquee prospects on draft day, but they are still relevant on the playing field, as evidenced by Gordon's ability to single-handedly lift the Badgers to the Big Ten Championship Game. The 6-1, 207-pound junior rushed for 151 yards and score a pair of touchdowns in the Badgers' 34-24 win over Minnesota. Gordon leads the nation with 2,260 rushing yards and has 29 total touchdowns (26 rushing; 3 receiving) as the Badgers' most important offensive weapon. 3. QB J.T. Barrett, Ohio State: A fractured ankle will prematurely end Barrett's season, but the redshirt freshman should earn a trip to New York based on his stellar production this season. Barrett totaled 45 touchdowns (34 passing; 11 rushing) as the point man of the Buckeyes' spread offense, while displaying a dynamic game that should make him one of the most explosive playmakers in college football for the next few seasons. Although the injury will make it nearly impossible for him to surpass Mariota on the charts, the fact that he went from backup quarterback to Heisman Trophy contender bodes well for the Buckeyes' national championship prospects down the road. 4. WR Amari Cooper, Alabama: At the behest of my colleague Daniel Jeremiah, I have to include Cooper on this list of contenders for the distinguished honor. The 6-1, 210-pound junior put on a brilliant showing against Auburn (13 catches, 224 yards and three touchdowns) to push his season totals to 103 receptions for 1,573 yards and 14 touchdowns. Those numbers certainly jump off the page, but it is his on-field dominance that makes him worthy of consideration for college football's top individual award. Cooper is the best player on the field whenever he plays; his dominance on the perimeter has pushed the Crimson Tide back into title contention. Given the spirit of the award, Cooper's play makes him a dark-horse contender to walk away with the honor in a few weeks.